A wide range of real-time data is accessible today. 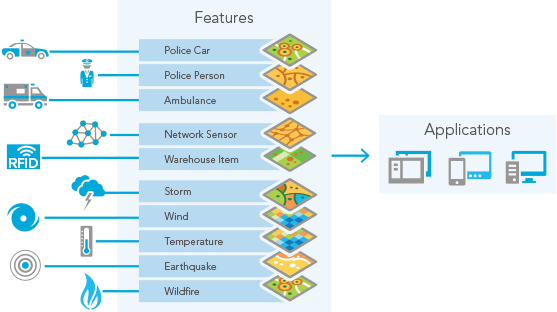 Connectors exist for many common devices and sensors enabling easy integration into your GIS. 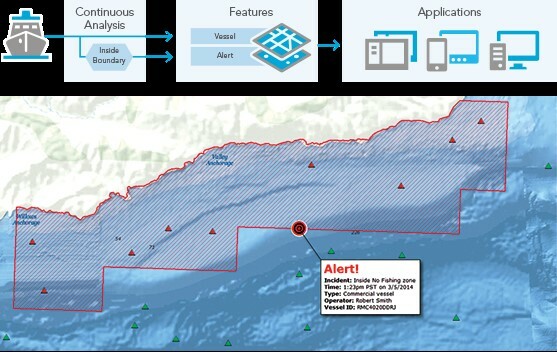 While it’s easy to connect a sensor to a feature and display it in real time, the next thing you might want to do is perform some additional processing or analysis on that data as you receive it. For instance, assume you are a member of an organization that is responsible for tracking and monitoring fishing vessels to ensure they are not fishing in a restricted zone. To accomplish this, you need an Automatic Identification System (AIS) feed that is updating a vessel feature with current locations. At the same time, you must continuously process, or filter, a vessel’s current location to detect when it enters a restricted zone, so that when it does, an alert appears on the operator’s dashboard. Having the ability to perform continuous processing and analysis on data as it is received allows you to detect such patterns of interest in real-time. Another example of continuous analysis on a real-time stream of data is one in which parents want to be notified when their child has left school property. Continuously updating the child’s current location, the analysis detects when he or she leaves school property. At that moment, the parents are immediately notified by email and SMS text message. Sending these kinds of updates and alerts to those who need it, where they need it, allows your key stakeholders to be notified in a way that is convenient for them.